Though oil pipelines have attracted bigger protests — Keystone XL from Canada’s oil sands into the United States and Dakota Access to move Bakken crude to the Midwest — opposition to natural gas pipelines is growing. Much of the opposition is in the mid-Atlantic states, where the boom in shale gas drilling in Appalachia’s Marcellus Basin has elevated the visibility — and controversy — of pipelines in an area generally unaccustomed to the oil and gas industry. Opponents have held rallies, pushed local politicians for support, gone to court — even illegally camped out in trees to block pipeline construction. “It’s definitely not getting easier to build a new pipeline,” Stan Chapman, TransCanada’s president of U.S. gas pipelines, told Reuters during June’s World Gas Conference in Washington, D.C. The 600-mile Atlantic Coast gas pipeline — from West Virginia through Virginia and into North Carolina — has drawn significant community opposition, including its plan to tunnel under the James River in Virginia. Construction is underway even as opponents continue to challenge regulatory approvals for the $6.5 billion project. 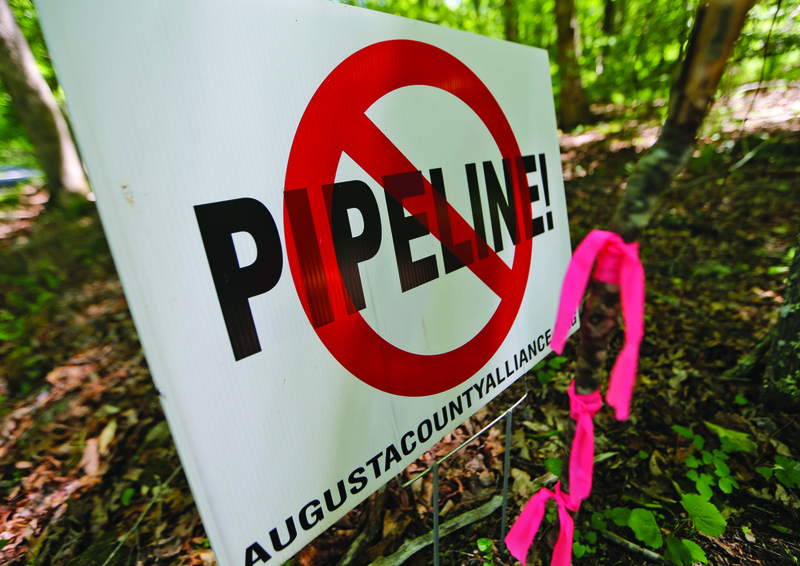 A federal appeals court on Aug. 6 vacated permits issued by two federal agencies for the pipeline. The court told the U.S. Fish and Wildlife Service to impose more protections for threatened or endangered species, including mussels, bumble bees, crustaceans and bats. The court also told the National Park Service to better explain why a pipeline crossing under the Blue Ridge Parkway in Virginia is consistent with the conservation and preservation purpose of a national highway. The project developer said it expects the agencies to quickly address the court’s concerns. Meanwhile, construction will continue in areas unaffected by the court action. Completion is planned for late 2019. The $3.7 billion Mountain Valley gas line could be delayed past its scheduled 2019 completion after the Federal Energy Regulatory Commission — prompted by a court ruling against the project — on Aug. 3 ordered all work to stop on the 303-mile West Virginia-to-Virginia pipeline. The court ordered the U.S. Forest Service and Bureau of Land Management to take a closer look at the line’s environmental impact. Changes in the pipeline route could require “further authorizations and environmental review,” FERC said. Pipeline opponents were successful with their legal strategy in stopping the proposed $1 billion Constitution Pipeline to transport Pennsylvania shale gas into New York. Section 401 of the federal Clean Water Act gives states the right to review projects to ensure they don’t harm local waters. “It essentially gives states veto power over federal decisions,” said Daniel Estrin, advocacy director for the Waterkeeper Alliance. The U.S. Supreme Court on April 30 denied a request from the pipeline developer to review the New York state decision that denied a permit under the Clean Water Act, emboldening other pipeline opponents to go after the same tactic in their states. Also in New York, the New York City Comptroller this month came out against the Northeast Supply Enhancement Project, a $1 billion gas pipeline that would cut across 23 miles of lower New York Bay to meet demand growth in Brooklyn, Manhattan and Queens — especially as consumers switch from fuel oil to gas for heat. “Allowing the construction of the pipeline risks damage to many of New York’s most precious habitats and natural assets,” the city official said. Though FERC’s draft EIS said environmental impacts during construction would be temporary, the comptroller said the EIS did not sufficiently account for climate change and rising sea levels. He wants a re-do. Also on the Atlantic Seaboard, the Alamance County Board of Commissioners in North Carolina on Sept. 4 unanimously adopted a resolution opposing a 72-mile connecting line to bring Marcellus gas into the distribution system. The board’s opposition focused mostly on water quality issues. The commissioners, who have no authority to stop the pipeline, sent their resolution to FERC. Even Texas is not immune to gas controversies. Two groups in the Rio Grande Valley — the Save RGV from LNG and the Lower Rio Grande Valley Sierra Club — oppose three LNG terminals proposed for the Port of Brownsville. FERC is scheduled to release draft environmental impact statements for the projects late this year. Several communities in the area have adopted resolutions against the LNG facilities. In Colorado, voters will decide in November whether to ban oil and gas drilling and flowlines within 2,500 feet of homes, businesses, playgrounds, waterbodies and drinking water sources. The state estimates that 85 percent of non-federal land in Colorado would be off-limits to new drilling. The current limit is 500 feet from buildings. Fracking opponents collected signatures to put the issue on the ballot, citing the increase in drilling amid the growing suburban communities north of Denver. The initiative is widely expected to face legal challenges if it passes. In the Pacific Northwest, the Puyallup Tribe of Indians has asked the city of Tacoma to re-examine whether a $310 million liquefied natural gas plant and storage facility — now under construction — is safe. The plant would liquefy gas and store the LNG in an 8-million-gallon tank to meet peak demand from utilities and serve as a marine fueling depot. The Tribe wants a supplemental analysis of the plant’s impact. The facility is scheduled to start service in 2020. Opponents to the proposed $10 billion Jordan Cove LNG project in Coos Bay, Ore., have long challenged land clearing for a pipeline, the risk to waterways and safety of the LNG plant. Now the developer is having trouble with the state Department of Energy, which last month recommended denial of the developer’s request for a waiver from a full review of the project’s power-generation plant. Calgary-based Pembina Pipeline is behind the Jordan Cove LNG terminal, which would provide an export outlet for gas from the Western U.S. and Canada. FERC is reviewing the project, including a 229-mile pipeline to link the LNG plant with the North American gas supply. The final environmental impact statement is scheduled for November 2019.